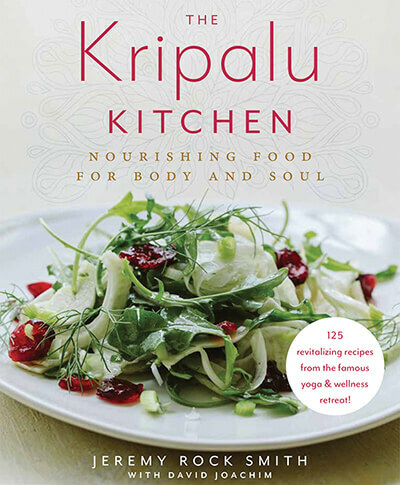 Now you can bring Kripalu’s most popular dishes to your table—our new cookbook, The Kripalu Kitchen, has just been released! Featuring 125 delicious recipes from our Executive Chef, The Kripalu Kitchen will revitalize your body and nourish your soul. We’re giving away 25 copies—enter now for a chance to win! Read the official giveaway rules here. Now you can bring Kripalu’s most popular dishes to your table! We’re thrilled to announce the release of our beautiful new cookbook, The Kripalu Kitchen, featuring 125 delicious recipes from our Executive Chef. Order at Amazon.com or Barnes & Noble. Also available on iBooks or Indiebound. Available for sale now. Embracing a mindful approach to eating and a seasonal approach to cooking, The Kripalu Kitchen offers recipes for a variety of dietary preferences—from vegan and vegetarian to gluten-free, grain-free, dairy-free, and sugar-free options. The five-ingredient and 30-minute recipes make it easy to cook delicious, healthy food anytime. Honoring the wisdom of Ayurvedic healing practices, The Kripalu Kitchen also includes a simple test to determine your personal nutrition profile, or dosha, and every recipe is marked to guide you toward the optimal diet for your type. From eye-opening breakfast ideas to international twists on popular favorites to comforting baked goods, The Kripalu Kitchen will revitalize your body and nourish your soul.